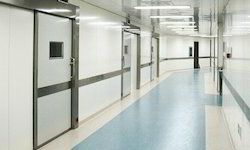 Our range of products include icu doors. Doors for use in clean room conditions and environments with special requirements. SIO Hospital Doors support the maintenance of a sterile environment by their hermetic closing and easy-to-clean qualities, making them ideal for medical field especially operating theaters. These tightly closing doors are available as single or twin leaf models. A large range of materials is available for the door leaf core and surface finishes, as well as the design of the door frames and sealing system, enabling a wide field of applications. In addition to a variety of surface finishes and customized door leaf cores, the doors can also be fitted with various sizes of windows, integrated blinds, and even laser protection according to requirements. Also, mechanical or electrical locks are available, as well as various models of cantilever-type handles. By building on the basic model, many variants for special applications can be created. Protection against electrons, X-rays and Gamma rays can be provided with the addition of a full-surface lead insert in the door leaf, in the inside of the frame profiles as well as in the plinth itself. With modified seals and a heat-absorbing core, the basic model becomes a certified smoke control door. Add a fire-retardant core and additional intumescent seals, PVC covered to fulfill hygiene requirements, and this model becomes a fire door with combined smoke protection.